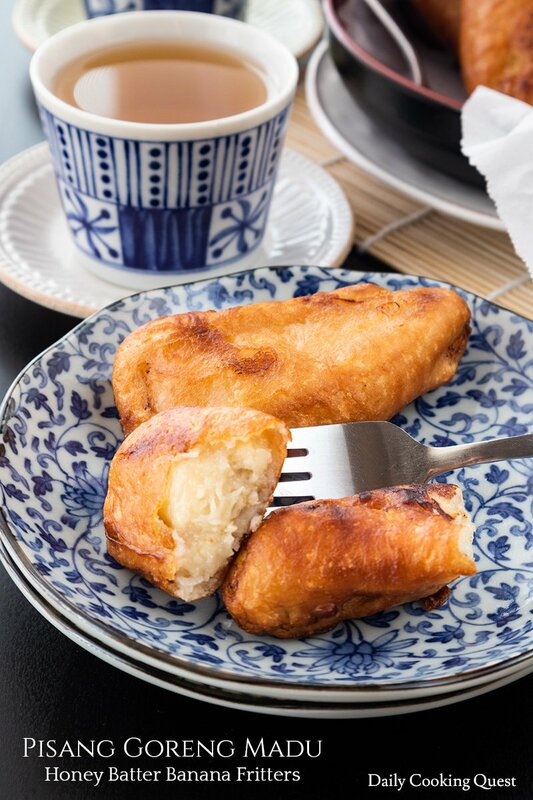 Pisang goreng (Indonesian banana fritters) recipe with honey batter. 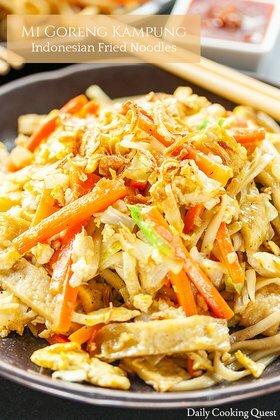 Recreate this favorite Indonesian street food in your home. 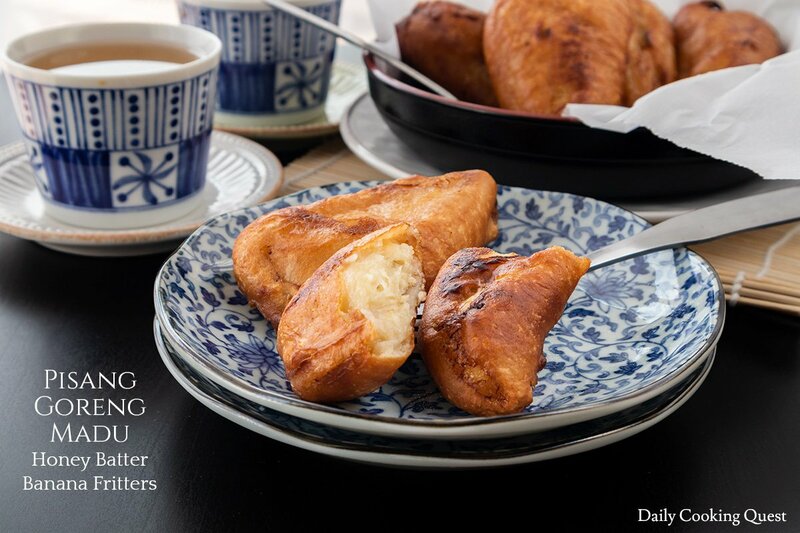 Anyone who grows up in Indonesian definitely has a fond memory of pisang goreng (banana fritters). 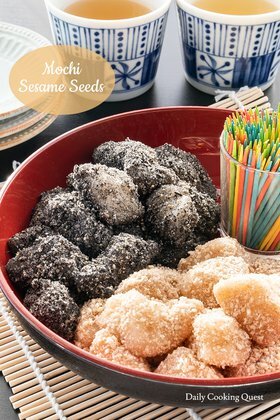 It is the most ubiquitous street food snack, a perennial favorite for all ages, from little kids to grandmas and grandpas. Here I added honey to the batter to produce pisang goreng madu (honey batter fried bananas). We don’t typically use eating bananas (a.k.a. cavendish bananas) for deep frying, or any sort of banana dish that needs cooking for that matter. Instead, we either use sabana banana (Indonesian: pisang kepok) or plaintain (Indonesian: pisang tanduk). Either one is fine for this recipe, but I stick to saba banana since that is the most common banana for making pisang goreng. Also, you want to wait for the bananas to ripen before using them. I usually wait patiently until the skins are all yelllow and even develop plenty of dark spots before turning them into fritters! Everyone loves crispy fritters, and I have two tips to help ensure your banana fritters have crispy skin. First, make sure the oil is hot before starting to deep fry. If you have a cooking thermometer, you want to start frying once the oil reaches 170 Celsius/340 Fahrenheit. Second, make sure your water to make the batter is super cold. If you have ice cubes in your freezer, it can really help if you throw in extra 5-6 ice cubes to keep the batter as cold as possible. Heat enough oil in a pot for deep frying. Make three slices along each banana's length, but keep the bottom 1 inch intact, so it can be opened up like a fan. Mix all-purpose flour, rice flour salt, baking powder, honey, and ice-cold water in a mixing bowl to make the batter. Once the oil is hot (~ 170 Celsius / 340 Fahrenheit), dip each banana into the batter, and fry until golden brown and crispy. About 2 minutes each. Remove and drain on paper towel/wire rack. Serve immediately. 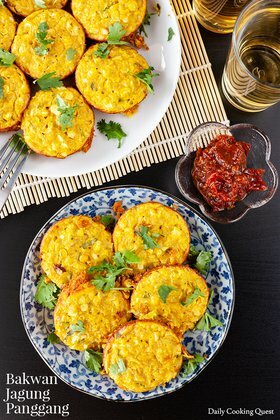 I love Banana Fritters, but using Honey Batter sounds so amazing! Same here, Shanika. And indeed the honey batter makes for a more awesome batch of banana fritters, if I may say so myself. 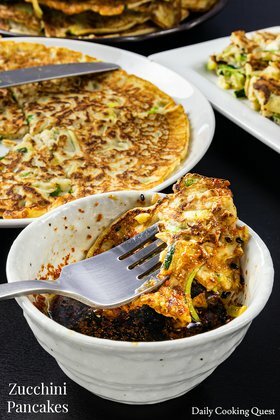 So are the saba bananas that you use for this recipe the same as the standard yellow bananas that you find in US supermarkets? Hi Emily, saba banana is closer to plantain. Usually, I can only find saba banana in Chinese/Thai markets. The bigger markets like 99 Ranch tend to have them year-round, while the smaller town markets only have them occasionally. When I cannot find saba banana, I use plantain which is much easier to find in regular grocery stores. Mmmmm this looks so delicious. Will def be trying! Such a delicious recipe! I could eat a bunch of these. 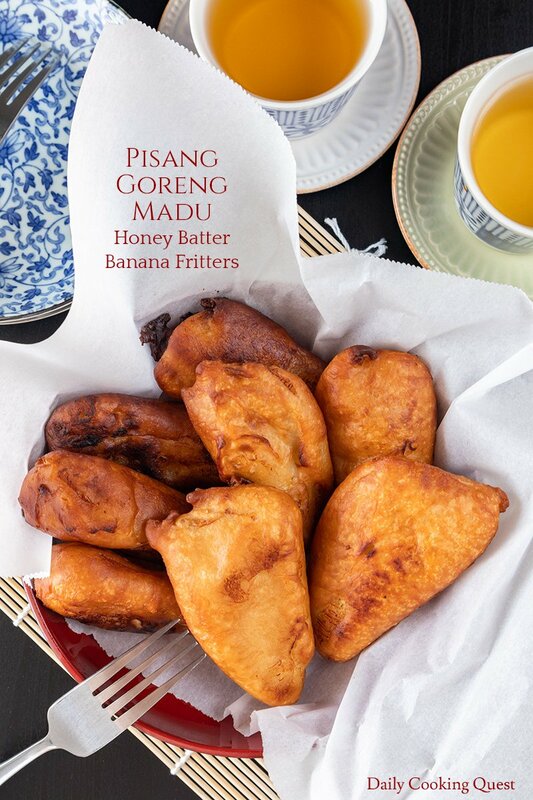 Can't wait to test myself and make the pisang goreng madu for one of the weekend nights!